In London, a circus troupe made up of the disabled and able-bodied alike explores diversity in all its forms. Meet Extraordinary Bodies. It’s Monday morning and the circus troupe is well into in the first workshop of the week. A young woman in a harness turns slow midair somersaults in the high-ceilinged brick studio. A drummer in a wheelchair idly spins a stick between his fingers between bursts of frenetic drumming, while a translator explains something in sign language to a group of performers. A large red hoop hangs in the center of the room, and occasionally a performer lowers themselves onto it as casually as they would an armchair and is hoisted towards the ceiling. 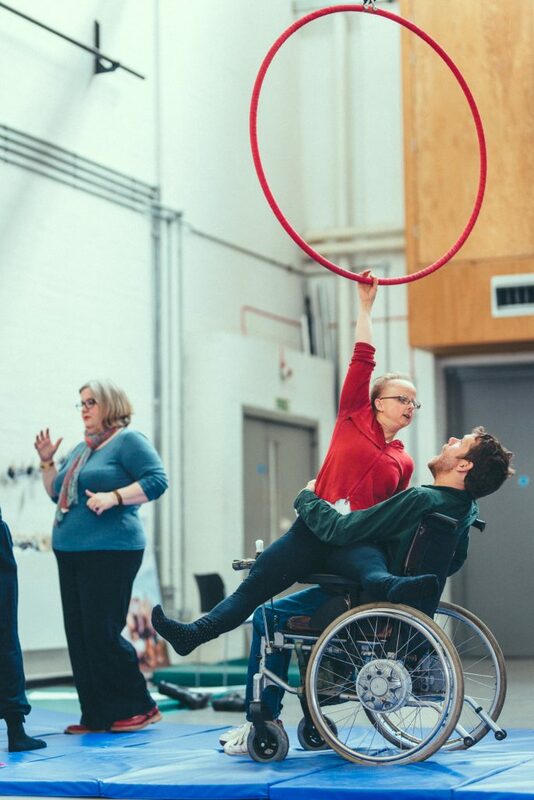 This is Extraordinary Bodies, a London-based circus company that delights audiences while challenging conceptions about what disabled people are capable of. 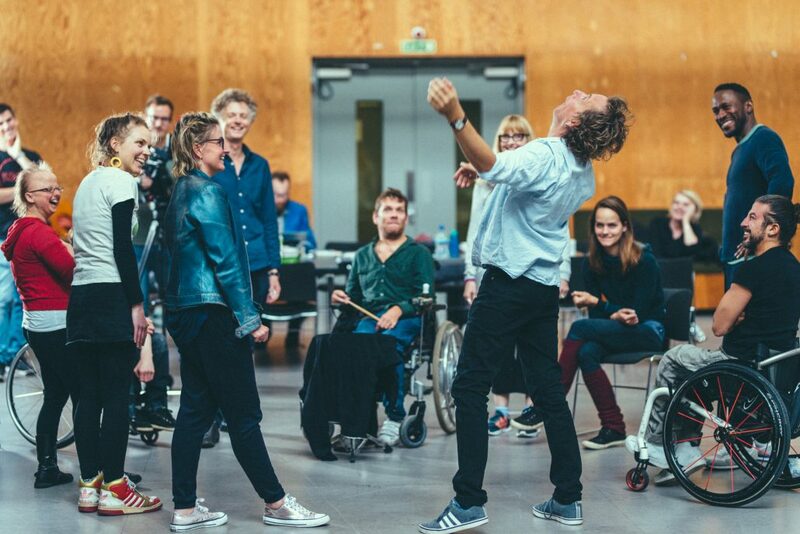 The troupe is made up of a revolving group of able-bodied and disabled performers, musicians and artists, and aims to represent the diverseness of society. Some performers are veterans: one has sung with the National Opera, while some are just starting their career. Today they’re practicing in a studio a stone’s throw from the venerable Old Vic Theatre. For the last few weeks, the troupe’s been workshopping around the UK, working with communities to share circus and music skills while exploring the theme of worth for their next show: What am I worth? Sarah is an Australian Paralympian-swimmer-turned-circus performer who has traveled from Sydney to workshop with the group, helping performers develop their acts and make the show accessible so everyone can engage with its themes. The thirty-four-year-old was born with Hallermann-Streiff syndrome, which affects bone structure. She’s also legally blind. Standing at around four foot seven, the performer says her unique look attracts attention, which she embraces onstage. Sarah Hoboult, who was born blind and with Hallerman-Streiff syndrome, practicing some of her acrobatics with a partner. Sarah says lack of sight gives her an advantage in her specialty, which is aerials and acrobatics. Overhead, the woman in the harness stops her slow somersaulting and reaches for a dangling microphone. “Eye color”, she speaks into it. “Height. Languages spoken.” There is a flurry of signing and performers arrange and rearrange themselves into order, exploring their perceived worth: the value society places on them according to these attributes. Jonathan grew up drumming on every available surface, and after a lengthy session where he drummed along to the Queen song We Will Rock You all over the house, his mum cracked and offered him lessons. Since graduating university, the twenty-three-year-old works as a sound engineer, composer and drummer for theatre productions. He got into theatre almost by chance after a suggestion from one of his lecturers, and fell in love with the heady, often chaotic world of live performance. Jonathan’s been paralyzed since birth, when an ischemic event interrupted blood circulation to his spine. During day-to-day life, Jonathan says he “just gets on with it”.